Bud had been in ROTC in college, so he entered the Army as a 2nd lieutenant in the Finance Corps & was a 1st lieutenant by the time he was discharged. We were engaged when he went in, but since the “Korean conflict” was very much “conflicting”, we decided to wait until he was a “short timer”—which means he didn’t have enough time until his discharge to be sent overseas—to get married. We were married in February & he was discharged that September. He was stationed at Ft. Ord, California, which is south of San Francisco & very near Monterey. Since no enemy naval operations or fighter planes penetrated our defenses during his service, he takes at least part of the credit for keeping California safe for democracy. We lived in a small, free standing house in nearby Seaside which was part of a court. I worked on post as a dental assistant. We would leave our home in sunny Seaside & drive to work every morning to find the sign that proclaimed “You are now entering Fort Ord” completely shrouded by fog. I loved being there with him except when the payroll was in. Then, not so much. He was a very restless sleeper. He would toss & turn & even argue in his sleep. When the payroll was in he was required to sleep with a loaded .45 caliber weapon on the nightstand. Those nights, I decided the better part of valor was to stay awake--& LIVE! Speaking of the payroll, that was the time for the big monthly poker game. Bud & some of the other Finance Corps officers & enlisted men would lock themselves in the vault & play poker (with the government’s money). The buy-in for the game was $200,000.00 each, in cash! When someone had won all the money, they would put it back in the safe, go home & go to sleep. The kindest thing I can say about the colonel in charge of the Finance Corps was that he was held in less than high regard by his men. He was a career officer & most of his contemporaries were at least full colonels or higher. He was still a lieutenant colonel who drank Amphojel by day & booze by night. He seemed to be over impressed by his own importance. An example: People keep dropping used paper towels on the latrine floor. Instead of just telling them not to, he issued a stern order. The next day, the colonel found another wadded up towel on the floor. He could see that it had writing on it so he opened it up. Written on it was, “THE PHANTOM STRIKES AGAIN”!! Bud once got a 77 day temporary assignment to Fort Hunter Liggett, about 80 miles away. It was VERY hot & humid & there was no air conditioning in their work area. They referred to it as “basic training for hell”. They paid rotating groups of reservists who were there for 15 day summer service. 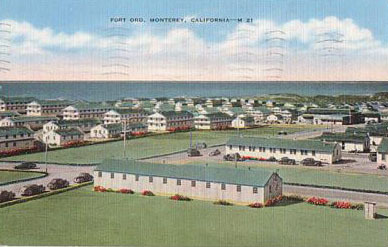 The Finance Corps personnel had to work many 19 to 21 hour days in a row in those conditions. The reservists had to be paid on Saturdays (by order of the colonel) &, at that time, banks were closed on Saturday so on Friday nights they had several hundred thousand dollars in cash in a 300 pound safe in their room. Bud had a loaded .45 next to him & told his men he was going to catch a nap. He told them to be sure to wake him when anyone went in or out of the door. They didn’t have the heart to wake him when the outside guards came in to switch with the inside guards. He woke with a start, had his weapon in hand & aimed at them before he realized what was happening. He came within inches of killing someone. After that, they woke him. Bud had to write checks fairly often for the Finance Corps. On one such occasion, he wrote a check for $500,000.00. The Bank of America cashed it & sent it to the Federal Reserve Bank. The Federal Reserve Bank cashed it & sent it to the Treasurer of the United States. The Treasurer bounced it & sent it back. It seems Bud had made a minor error—he forgot to sign it! It’s a good thing my husband is honest. He had figured out a “foolproof” scheme for robbing the payroll. You would just have to be on the roof of the Finance building with some firecrackers. The colonel would be in the yard with a full clip in his .45. The MP’s would be there with machine guns. You light the firecrackers & throw them into the yard. Everyone panics & shoots & kills each other. You walk down, pick up the money & leave.